Working full time means I don't get to cook wholesome meals for the boy everyday. While I am grateful to the MIL for cooking porridge with the freshest ingredients for her precious grandson, I am sensing the mini food muncher we have at home is getting a tad bored with the same ol' food served at the dinner table. 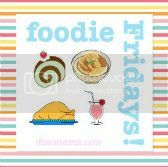 So, when I get a chance to, I will fix up some quick and simple meal for this boy who has an affinity with anything that spells F-O-O-D.
2) Peach x 1, peeled and sliced. Once done, top them onto a bowl of rice and serve. 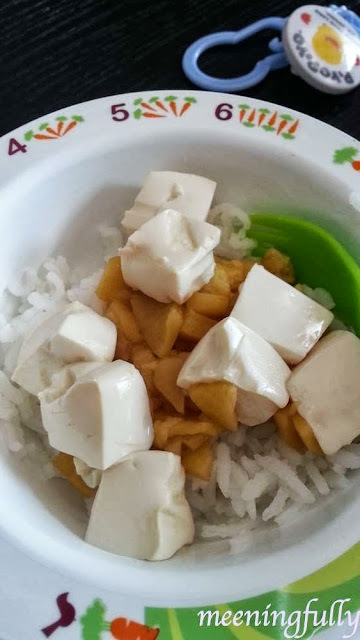 If your child needs something softer, you can puree the peach after steaming before drizzling the puree on top of the tofu and rice. What are some quick-fix kiddy meals you have made for your little ones?